First Voice Jump Bag Emergency Treatment System | Prepper Gear- Survival Supplies and Know-How! The First Voice Jump Bag Emergency Treatment System is an all in one first aid system that is easy to use and reliable. The First Voice Emergency Response Kit features a color-coded and tabbed responder handbooks for medical solutions to various injuries. The medical handbook gives specific instructions for emergencies while complying with major training organizations, the ECC, and National First Aid Science standards. The Jump Bag Emergency Treatment System features 7 color-coded zipper bags that respond to each emergency including: Bleeding, Fracture/Sprain, Choking, and even CPR. The inventory refill checklist includes expiration dates, so your disaster kit is always stocked and ready to go. All the contents of the first aid responder kit easily fit into a durable Cordura bag and is great for: construction sites, schools, industrial plants, and even remote situations where first aid situations may occur. 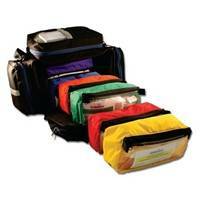 Feel safe and secure today, buy your First Voice Jump Bag Emergency Treatment System from ActiveForever. The First Voice Jump Bag Emergency Treatment System is available for just $544.89 with *free shipping* from Active Forever.